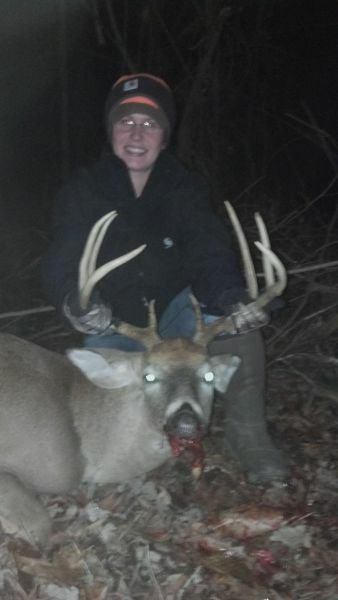 My hunt started on the evening of Thursday, December 27th, 2012. My father and I were sitting in a soybean field in person county, North Carolina. The buck first appeared at about 5 o'clock and the sun was setting. He stepped out into the open and I said to my dad 'There is a big buck in the field directly in front of me.' We watched him for a few minutes as he ate and then another smaller buck came out. Then they began to fight which was very unusual for the end of December. A small doe was eating over to our left and she suddenly spotted us. She eased out of the field but the big buck being curious started walking closer to see what she had been frightened of. As he reached the distance of about 125 yards from us he turned broad side and I took the shot. At Dark we eased our way to the other end of the field and found a blood trail but didn't want to push him in case he wasn't completely dead yet. At 8 o'clock that night we came back to see if we could find my deer. We trailed him about 100 yards into the woods where he fell, the huge 9 pointer was down. I couldn't have been happier with my kill for he was bigger than any other buck I had ever killed.